I cannot believe it, we are into the last month of 2015! The year has gone by so quick, but I am glad because it means we are into the holiday season! Lately, I have been obsessing over knot & bow goodies. They do a lot of chic craft and stationary type of items. Anyways, I really need to get some of their super cute tags with twine as well as confetti balloons and anything else knot & bow related like all of their fabulous confetti! Holiday season means holiday parties so I am going to need some cute outfits! Velvet is this season's fabric and that deep maroon colour makes this dress perfect for the festivities! Plus it is Aritzia which is always amazing quality. I also want to pick up another Wilfred sweater from Aritzia in the durandal style. I currently have it in the light taupe grey and it is AMAZING. This sweater is 100% merino wool from Italy. It is the warmest coziest most amazing sweater ever and the high faux turtleneck is amazing because turtlenecks always make me feel like I am choking gah! I am obsessed with my Lemon Drop hair brush from the Dry Bar and I cannot believe it comes in a MINI TRAVEL SIZE! Yup, I pretty much just need to get it for the fact that it comes in a miniature version. And keeping with the sweets, some more Sugarfina please! My friend had given me a box of the champagne baby gummies and they were yumm! Maybe a couple more cube boxes full of deliciousness? Lastly, that accent pillow, Just Believe in Your #Selfie, just makes me giggle. I do take selfies, but I generally just keep them for myself on my phone so even though I do not share them with you - I do take selfies! Plus it sends a positive message in a cheeky way! That is it for my December wishlist! 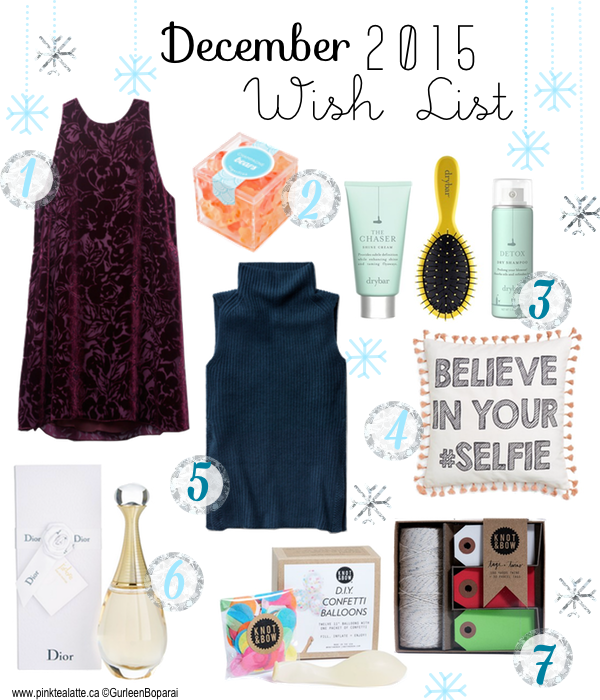 Got anything on your December wishlist that you hope to receive? Let me know in the comments below! I am just curious to see what you guys like!